“Encounter 52” is a collage consisting of only two materials: cotton canvas and porcupine quills. 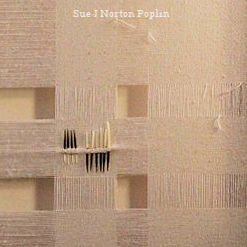 The geometric design on the canvas was created by pulling threads both horizontally and vertically. I felt the piece needed some kind of subtle focal point, hence the porcupine quills. The title of this collage comes from the 52 quills I pulled out of my dog Doodle after his encounter with a porcupine.